What can programmers, writers, designers and project managers create in one night? A revamped user experience and revised content strategy for The Coalition for a Livable Future’s Regional Equity Atlas, of course! The concept of a hackathon is simple (though the work is far from it) – web professionals engage in collaborative web programming and design to enhance an organization’s online presence in a short amount of time. See how our 2013 hackathon helped The Ride for Roswell in Buffalo, New York. 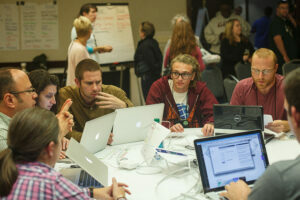 A HighEdWeb hackathon unites web professionals from hundreds of colleges and universities with diverse skill sets (including programming, writing, graphic design, project management and more). This year, the HighEdWeb hackathon will focus on supporting the Coalition for a Livable Future (CLF), a nonprofit based in Portland, Oregon, and renovating its Regional Equity Atlas project. Questions about the Hackathon? Contact the Hackathon coordinator, Anne Petersen. ​What is the Regional Equity Atlas? The Coalition for a Livable Future’s (CLF) Regional Equity Atlas is a tool that enables the group to understand how well different neighborhoods and populations are able to access the resources and opportunities necessary for meeting their basic needs and advancing their health and well-being. By illuminating the Portland metro region’s geography of opportunity, the Equity Atlas has transformed conversations around equity and provided concrete information to guide local advocacy and policy making to address disparities. The original Equity Atlas was released in 2007 as a book of static maps and text. CLF released an updated version of the Regional Equity Atlas (Equity Atlas 2.0) in June 2013 that includes an online mapping tool that gives users the ability to create their own maps and an interpretive website that provides a gallery of static maps and analysis. The website also includes metadata, user guides and tutorials, and a host of complementary features including a storytelling project and white paper series. We can’t pull off this ambitious hackathon without you! And, there are many ways for you to put your web powers to work. Interested in sponsoring the Hackathon? Contact the HighEdWeb sponsorship committee. The clock is ticking – only ONE day left of HighEdWeb 2014 early bird registration! Sure, we’ll keep registration open as long as there are seats available, but when you register during the early bird period (aka: by the end of tomorrow, Thursday, July 31), you save $125 off the full conference rate. So don’t delay — register now! Need a world-renowned reason to hit up #heweb14? 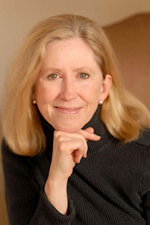 Well, let us share this: HighEdWeb is pleased to announce that Dr. Moira Gunn (@biotechnation) will deliver the Annual Conference’s opening keynote address on Monday, October 20. The first woman to earn a doctorate in mechanical engineering at Purdue, Dr. Gunn worked as a NASA computer scientist and engineer. Today, she educates the public about issues in science and technology on NPR’s nationally-syndicated “Tech Nation” and “BioTech Nation” radio programs – and she’ll be talking with HighEdWeb next. Hear more from Dr. Gunn via her TEDx PurdueU talk. Registration is filling fast, and once the conference is full, registration will close forever. Be sure to register soon to ensure your spot! HighEdWeb 2014 early bird ends in ONE week! July means warm days, the halfway mark of summer break, post-All Star break baseball…and just ONE week left of HighEdWeb 2014 early bird registration! July 31 is the last day to take advantage of $125 in early bird savings off regular conference registration pricing. Registration is filling fast – we’re at about 61% of seats sold, and once the conference is full, registration will close forever, early-bird or no. Be sure to register soon to ensure your spot! We know you have lots of options when it comes to how you spend your professional development dollars. We believe that HighEdWeb 2014 in Portland, Oregon, will be the best investment you can make to develop your skills. Access to 70+ presentations in six different thematic session tracks, plus dozens of great posters. A seat at two great keynotes, including a humorous look at all things geek and technology with @Nerdist Chris Hardwick. The option to add even more to the learning by signing up for a HighEdWeb Academy and pre- and post-conference workshops. Opportunities to network with the HighEdWeb community at conference meals (breakfast, lunch and snacks included!) and many networking events. Plus, you get to experience all of this in beautiful Portland, Oregon! Dubbed the laboratory of all things hip in North America, Portland is home to the Silicon Forest, Powell’s City of Books, the world’s first farmer’s market, breathtaking landscapes and food trucks galore. HighEdWeb 2014 is pleased to announce that Chris Hardwick, CEO of Nerdist Industries – also known in certain (very social, very popular) circles as The Nerdist – will deliver the Annual Conference’s closing keynote address on Wednesday, October 22. Save $125 by registering by July 31! Chris Hardwick is a chart-topping podcaster, television personality, stand-up comedian contributor for Wired magazine and creative head/CEO of the multi-platform media behemoth known as Nerdist Industries. A podcast network including the flagship Nerdist Podcast that averages 5M monthly downloads. He shares his humorous take on social media, technology and all things nerdy as the host of Comedy Central’s “@Midnight” and AMC’s “The Talking Dead,” and will bring that perspective to the HighEdWeb stage in October. P.S. HighEdWeb is the conference created by and for YOU, so come be a volunteer at HighEdWeb 2014 and help us make #heweb14 magic happen! Want to learn more and tell us how you can help out in Portland? Read on. The end of fiscal year 2013-14 is near, and we have a great play for how you can use those extra end-of-year funds in an awesome way — register for HighEdWeb 2014 in Portland, Ore., and snag our great early bird deal. HighEdWeb is the annual conference of the Higher Education Web Professionals Association, created by and for all higher education Web professionals — from programmers to marketers to designers to all team members in-between — who want to explore the unique Web issues facing colleges and universities. Already registered? Add a workshop or Academy! Supercharge your conference experience by adding an Academy or workshop to your registration. These extra professional development opportunities take an in-depth look at special topics, skills and issues relevant to higher education web professionals. See our workshop lineup and learn more about our Leadership, Integrated Marketing and Technical academies. 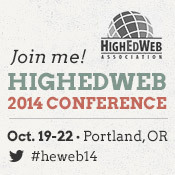 The HighEdWeb2014 schedule is now live! The moment you’ve been waiting for has arrived: the HighEdWeb 2014 Annual Conference track presentation schedule* is live! This year brings a stellar lineup of topics and speakers, with 70+ presentations aimed at programmers, strategists, developers, designers, managers, marketers and everyone in between! Head on over to the conference website to review the schedule, complete your registration and begin the “rock-paper-scissors-lizard-Spock” process of deciding which track sessions you’ll attend! * Information about our lineup of poster presentations will be coming soon! Stay tuned. Registration is also open for our array of half-day pre- and post-conference workshops, offered at $120 for one or $180 for two. Workshop topics range from video production to accessibility to responsive web design. View the full list of workshops and add one (or a few!) to your registration today! Go in-depth and take part in one of our professional Academies, held on October 18-19 in conjunction with our 2014 Annual Conference in Portland. These two-day intensive professional development opportunities are offered in three topic areas: Integrated Marketing, Leadership and Technical. Register today. We recommend registering early for HighEdWeb 2014, as spots fill up quickly. Plus, register by July 31 and you receive the #heweb14 early-bird discount — a savings of $125! Do you like to work behind the scenes? HighEdWeb runs on volunteers, and we are looking for awesome people to help at this year’s conference. From registration to our #heweb14 special events, we need you! Contact George Sacket if you are interested. HighEdWeb 2014 registration is now open! It’s official — HighEdWeb 2014 Annual Conference registration is now open! Head on over to the conference website to reserve your spot for October 19-22 in Portland, Oregon! We recommend registering early, as spots fill up quickly. Plus, register by July 31 and you receive the #heweb14 early-bird discount — a savings of $125. And if you need another reason to register early, we have one word for you: workshops. A great lineup of pre- and post-conference workshops is now posted on the 2014 schedule and are open for registration. See a workshop you like? Add it to your registration today; space is limited! Jump start your annual conference experience by taking part in one of our professional Academies, to be held in Portland on October 18-19. HighEdWeb Academies provide interactive learning experiences in small group settings, featuring workshop-style presentations from leaders in the field. Our conference hotel, the Hilton Portland and Executive Tower, is now taking online reservations. You can also call 1-503-226-1611 to book your room – just ask for the HighEdWeb rate.